iOS exposes a secure storage "Keychain" which can be used by applications to securely store critical and security sensitive data such as symmetric keys, asymmetric private keys, certificates, username, passwords etc. As part of penetration testing iOS applications it is often necessary to be able to inspect the contents of this keychain to identify what the application is storing in the keychain and how it is potentially using the same. A common example is to use "Keychain" to store the login username and password so that the user is logged in seamlessly when the application is launched. 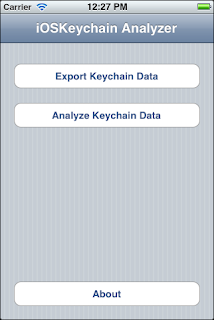 The iOS simulator simulates this "Keychain" as a SQLite database. 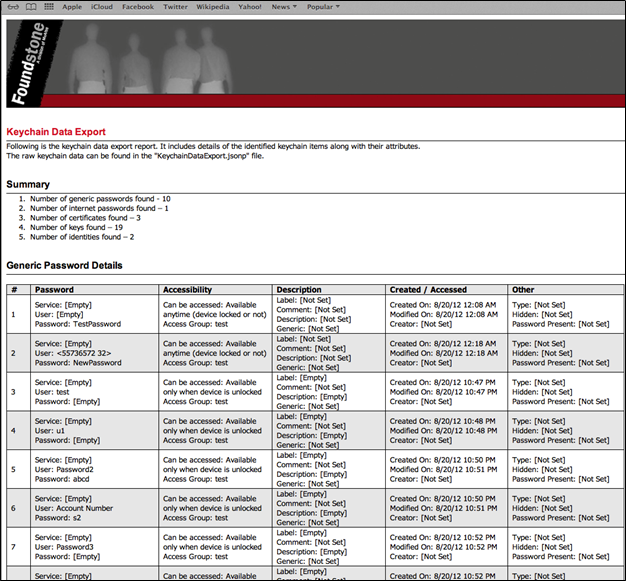 However, this SQLite database is encrypted and as such opening it does not help much. iOSKeychain Analyzer extracts and exports the contents of the keychain (on the iOS simulator) along with the associated attributes/properties. The types of keychain items range from passwords, certificates to keys. The attributes for these keychain items include details such as clear text values, accessibility details, description/comments, creation/modification etc. Additionally, the tool also analyzes the iOS simulator keychain contents from a security standpoint. The source code should compile successfully on Mac OS X 10.7.4/Xcode 4.4.1/iOS SDK 5.0. Once compiled, you can run it on an iOS 5.0/5.1 simulator. Though not tested, the code should compile and run fine on a more recent platform/environment than this. A compiled binary is provided for the iPhone 5.1 Simulator. To use this binary as is - copy the "01EFB1DB-4A47-45A1-B692-F88996FAC4F8" to "/Users//Library/Application Support/iPhone Simulator/5.1/Applications". Then launch iOS Simulator. Set the device to iPhone and version 5.1 and the application should appear installed on the simulator. You can then launch from there. First install and configure the application that you are testing within the iOS simulator. 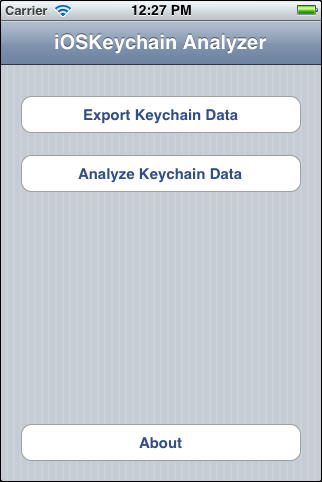 If iOS Keychain Analyzer is not installed within the simulator then install it. See the "Installation / Pre-Requisites" section for instructions on how to install the tool. 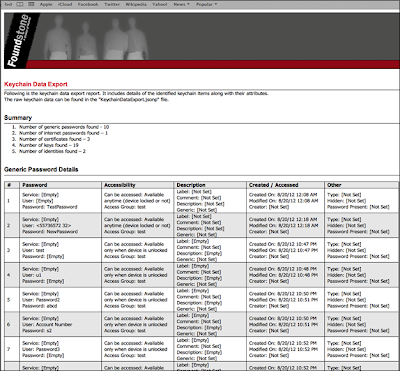 It'll create the Library/Caches/DataAndAnalysisReports (e.g. /Users/[Username]/Library/Application Support/iPhone Simulator/5.1/Applications/01EFB1DB-4A47-45A1-B692-F88996FAC4F8/Library/Caches/DataAndAnalysisReports/) folder to store the results. 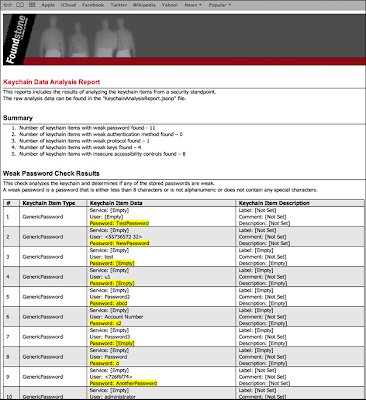 iOSKeychainAnalysisReportViewer.htm - This report displays the keychain data analysis report in a readable format. 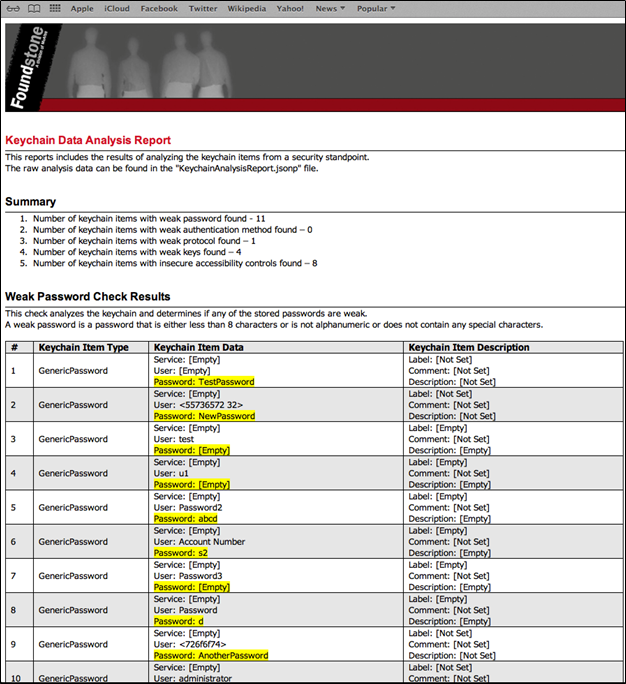 The raw analysis report can be found in the "KeychainAnalysisReport.jsonp"
The tool does not export the clear text public key or private key. The reason being the API exposes the opaque public/private key structure but not the actual bytes.